It's about that time of year! The holiday season is upon us! Before we start thinking about that Christmas holiday season, we have to think about Thanksgiving! I've been asked to talk about our turkeys that we get for Thanksgiving as well as for Christmas. The Turkeys that we get for the holidays are a fresh, Gluten-Free, All-Natural Turkey with no hormones or salt solutions (if you look at most turkeys, they have a solution added to "make them more tender"). Ours are raised on an Amish farm in Iowa. A lot of people ask if the turkeys are local...well this is about as local as I can get. We've had a LOT of luck with this company and they have never let us down! We have been getting turkeys from the same place for over 20 years! We could purchase different turkeys that are less expensive, but this is a quality turkey and I'd rather have that than a cheap turkey that people won't like. The cost of the Turkeys this year is $2.69lb. The Turkeys are anywhere from 10-28lbs. I would ask that you reserve your turkey NOW because then we would be more likely to have the exact size that you're looking for for your Thanksgiving meal. 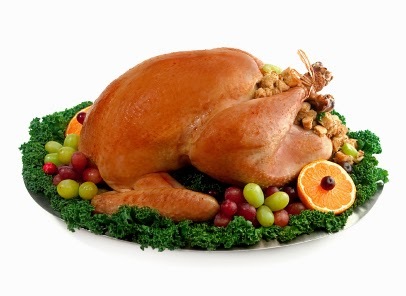 Organic Turkeys (8-13#), Roasting Chickens, Turkey Ducks (Muscovy Ducks), Turduckens (already stuffed), Ducks (5-6#), Geese (12-14#) and Turkey Breasts (5-8lbs, 8-10lbs, 10-12lbs. & 18-20lbs). Order NOW before we're all sold out!